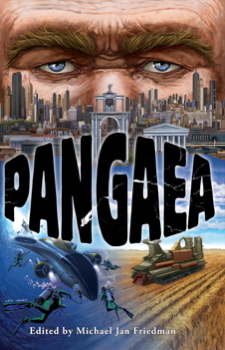 From the mind of editor Michael Jan Friedman, made possible by the generosity of more than three hundred Kickstarter backers, and featuring the talents of fourteen experienced authors, I am beyond pleased to inform you that Pangaea is now available! At least four times in Earth’s history, the continents have come sliding together to form a single mass—a super-continent. Geologists have dubbed the most recent such formation Pangaea. Of course, Pangaea broke up a long time ago, and because it did, different portions of mankind developed in drastically different climes and circumstances. But what if we were living on one of the super-continents? What if all of humanity was confined to a single landmass… and had been so confined for all of our recorded history? 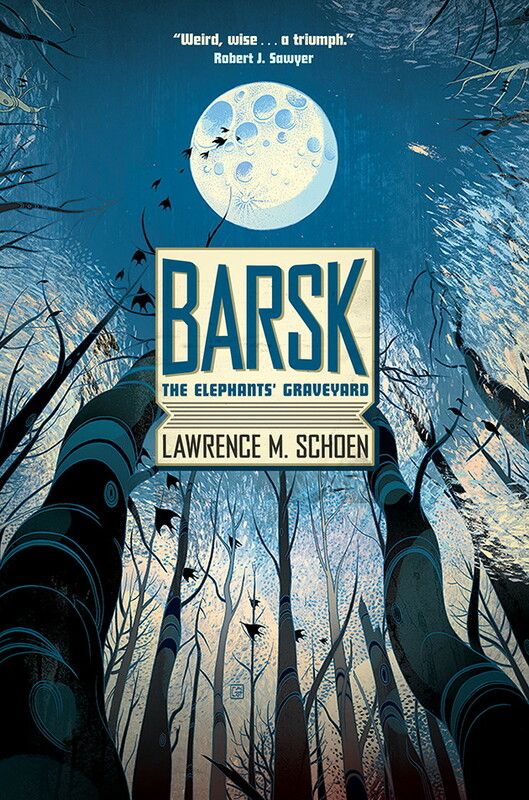 Ladies and Gentlemen of the Internet, may I present for your anticipation, gradual build-up of ultimately brain-wrenching desire, and immediate viewing pleasure, the cover of my forthcoming novel, Barsk: The Elephants’ Graveyard. 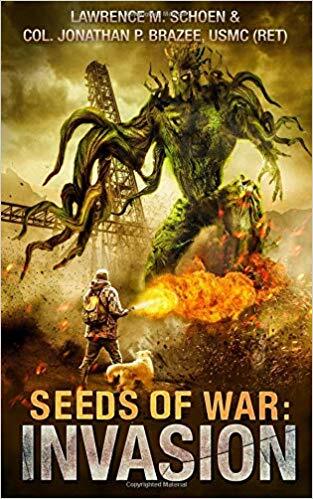 My editor informs me that the release doesn’t happen until December, but the way I choose to spin that is it creates an opportunity for a solid ten months of buzz, and a cover reveal is an awesome beginning. The cover art is by Victo Ngai, a Society of Illustrators NY Gold Medalist (she actually has a stack of gold and silver medals), and depicts her conception of one of the artificial “vents” that occur within the rainforests of the islands of Barsk. Specifically, a shaft visited by Pizlo, a young boy whose very existence is outside the strictures of Barsk culture. He hung in open air, ruminating, suspended upside down in a well-tended shaft walled on all sides with living green. Seven such chimneys existed on the island of Keslo; every island on Barsk boasted at least one. Fant society created the insubstantial monuments as part memorial and part warning. Few reached all the way to the uppermost limits of the forest, or ran all the way down to its roots. Barskg is a world of almost constant rain and breaks in the cloud cover are infrequent. Rarer still are the times when the clouds happen to part and allow a glimpse of any of the planet’s moons. In the scene Victo Ngai referenced for the cover, Pizlo has gone to a specific chimney at a specific time, following the urging of the voices in his head, to see his third of Barsk’s seven moons. Pizlo is a weird little kid, and he’s convinced the moon not only speaks to him, but tells him secrets. And that’s going to have to hold you for a while, but I promise, there’ll be more hooplah in the weeks and months to come. Not just because lately it’s been much more common to get my schedule in the final week before the con (and often much less), but because of the incredible array of authors who will be showing up at the convention, folks like Elizabeth Bear, Charlie Stross, Karl Schroeder, Allen Steele, Carrie Vaugh, Walter Jon Williams, and many more. And, it certainly doesn’t hurt that Steven Brust is their GoH, as I am a long time fan and collector of his work. Stories that make you go, “Yum!” How do you describe food to convey mood or set the scene? Join our panelists as they dish on the culinary delights that tantalize us in fiction, from regional teas to kingly feasts. What works? What doesn’t? And what should you know about a food-centric scene? with Carrie Cuinn (M), Steven Brust, James Cambias, Fran Wilde, and me! Let’s talk about psychology, linguistics, Klingon, hypnosis, small press publishing, award nominations, my forthcoming book from Tor, or whatever else you want to ask me about as we enjoy coffee, tea, or in my case a Diet Coke™. Sign-up is required at Program Ops in the Galleria, but I’m sure we can fit you in. 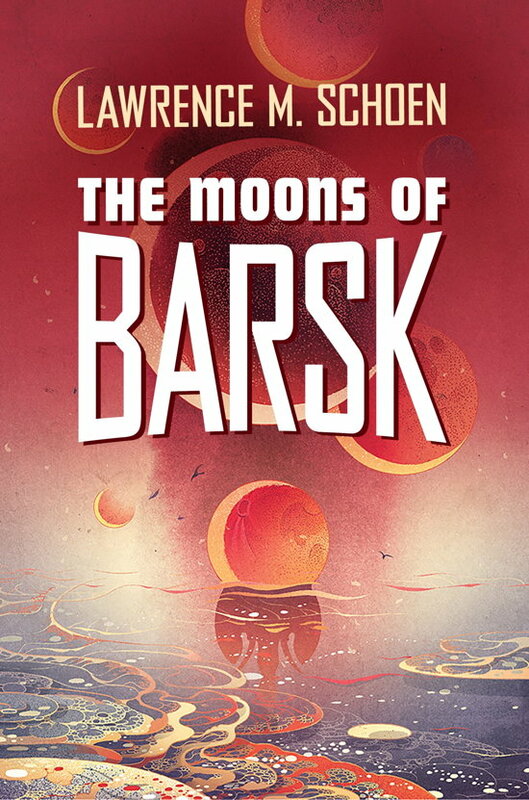 I’ll likely read from my new novel, Barsk: The Elephants Graveyard, unless people would rather hear a bit from my recent Amazing Conroy novella, Calendrical Regression. Either way, come on by, show me some love, on this cold Valentine’s Day morning (sniffle, cuz my wife is back in Philadelphia). This is your chance to bring stuff for me to sign! I know, it’s exciting! with M.L. Brennan, Daniel M. Kimmel, and me! Is there really a blue sheet of death? Does an encouraging form letter mean less or more than a generic personalized response? These are just a few of the questions that new writers ponder as they try to read between the lines of the rejection letters they receive. Every new writer goes through this dreaded stage (better known as “rejectomancy”) as they try to glean some hidden meaning within the text. Writers who have been there share their own rejectomancy stories and give some helpful advice on ways to avoid the “rejectomancy” trap. with Stephen P. Kelner (M), Craig Shaw Gardner, James Patrick Kelly, Margaret Ronald, and me! And of course, Barry will be on hand to pose for photos with you. See you in Boston! I’m not sure if I’ll remember (or have the time) to do this every month, but if it happens that I do, I’ll make available a new ebook short on the first Friday of each month. It will show up on my website’s Freebies Page. I’m starting the year with “Cat Futures,” originally published back in 2005 in the long gone online zine, The Town Drunk. 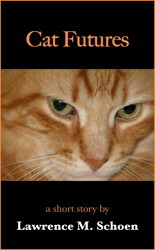 As I mention in the story’s introduction, every author has to write a cat story sooner or later, and this was mine. I hope you like it. Please join us in marking today, December 21st (or as it’s known in the northern hemisphere, the Winter Solstice), as Celebrate Short Fiction Day. Seriously, like you needed an excuse? All over the Internet, authors and small presses are making samples of their short fiction available to you for free today. Here’s a link to the freebies from Sally’s Pixel Hall Press, and here’s a link to an updated (i.e., better ebook code than the last version) of a short story over on my Freebie Page. Please help spread the word, and the fiction! As exciting as the past couple of days have been, what with all the announcement of this year’s Nebula Award Nominees, all of that has to take a backseat to today. Why? Because today is INTERNATIONAL POLAR BEAR DAY!!! It’s not my place to tell you how to observe such a splendid day, but I hope you find something that works for you. Maybe you’ll make a charitable donation Polar Bears International. Maybe you’ll eat a Klondike bar. 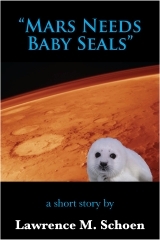 As for me, I’m giving away copies of my short story, “Mars Needs Baby Seals,” because I originally wrote it as part of a contest involving less common holidays and I chose this one. If you’d like an electronic copy of the story, simply go to my Contact page and leave me a note with 1) your name, 2) your email address, and 3) an indication of whether you’d prefer ePub or mobi format (sorry, those are the only formats available). And that’s it. This offer is good through Sunday, March 2nd, 2014. Please allow up to 48 hours for me to email you back with the story. I’ve received confirmation from programming with regard to my participation in Strolling with the Stars. I’ll be strolling on both Thursday and Monday mornings. But because someone screwed up, you won’t see my name listed among the “stars” in the pocket program for those days, as this had already gone to press. I’m told the correction will make it into the program app, the online listing, and the pink sheets. And if you’re reading this here, then you know too. I’m also very pleased to see that the online version now lists locations, which will make actually showing up for events (both panelists and audience members) much easier. And with that now resolved, here at last is my complete schedule for Lone Star Con 3! 9:00 – 10:00 p.m. | Rivercenter Lobby| Stroll with the Stars. Possibly the only exercise many of us will get all weekend. Come walk and talk (it will be just like an episode of “West Wing”). with Bobbie DuFault, Phil Foglio, Liz Gorinsky, Hagrid, Jason M. Hough, Stina Leicht, C. J. Mills, Steven Silver, and Catherynne M. Valente. 6:00 – 8:00 p.m. | | Private reception for James Gunn and many of his students. Shhh… it’s private. Seriously, I’m very happy to get to be a part of honoring this fine writer and teacher. 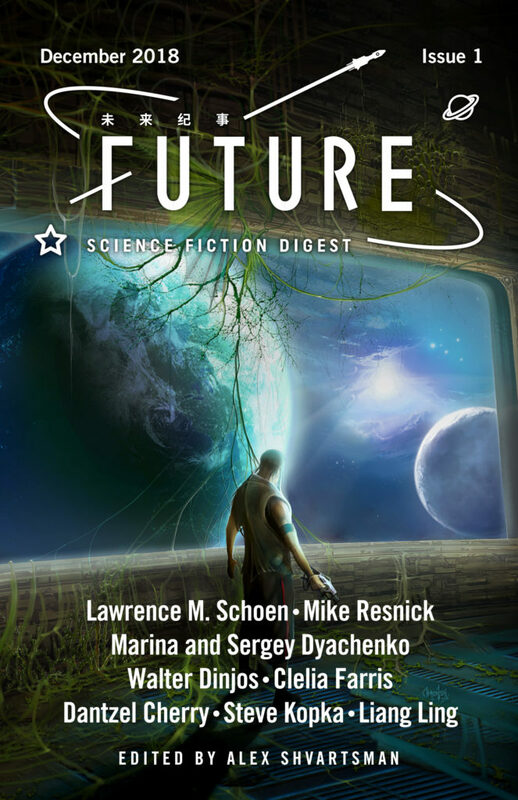 Several dozen writers “on the hungry edge of speculative fiction” sate their appetites with breakfast as online acquaintances meet face to face for the first time, and old friends reunite. Also pancakes. I’ll sign most anyting (well… not a blank check), so come on by! alongside Carol Berg, Lillian Stewart Carl, and Ian Tregillis. For more than 20 years I’ve been promoting the warriors’ tongue around the globe. 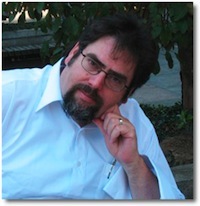 For WorldCon I’ll present an intense (but fun!) whirlwind through the workings of the galaxy’s fastest growing language. Prepare yourself for 90% of Klingon grammar in a mere 50 minutes! It’s been a wild year for SFWA, and I’m sure this will be a “lively” business meeting. It is also the 1st meeting for new president Steven Gould. Show up on time and maybe we’ll even finish on time. If First Contact were to happen today, and was an open event, how would the human race react? Would we feel inferior, or just try to steal their technology? Might we even attack them? What is the probability of them being hostile, curious, invading, tourists, game hunters, refugees, or would be gods? with Liz Argall, Cenk Gokce, and Jeffrey Shanks. A tour through select pieces of the art show which I feel speak to both the warrior’s heart and the poet’s soul of your typical Klingon. 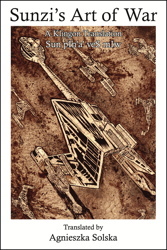 Portions of the tour *will* be in Klingon, but translations will be available as needed. Please do not bring your bat’leth, as it tends to upset the art show staff. In the spirit of “paying it forward,” two professional authors serve up insightful critique to three junior writers. Not a spectator sport, but an important part of the my annual Worldcon experience. I’m privileged to be working with Matthew Johnson. I’m leaving off the names of the three writers we’ve been assigned, to better facilitate their stalking of me. with Paige E. Ewing and Karl Schroeder. The voting members of the Worldcon hand out shiny golden rocket ships in a ceremony that’s almost guaranteed to run long. Place your bets early for who will win. The con is almost over, but let’s take one more stroll together, shall we? with David Boop, James L. Cambias, Bobbie DuFault, Gini Koch, Trina Marie Phillips, Jessica Reisman, Shanna Swendson, Howard Tayler, Toni Weisskopf, and Mel White. You have to buy your own beer (and I’ll be drinking Diet Coke), but sign up and come by. We can rehash the convention and I’ll tell you all sorts of lies. That ought to be enough to keep me busy, especially when you add in the evening parties, the dinners that Valerie is planning, and the handful of panels and readings I’m hoping to attend. There should even be room for a couple business meetings (what you call “lunch”). Barry will be with me throughout the convention, and there will also be at least two (maybe more?) skilled and beautiful buffalito wranglers wandering around with their own plush buffalitos. Feel free to stop any of us for a postcard that will allow you to download a free copy of the latest Conroy story, “Trial of the Century,” a novella which takes place between the end of the first novel and the start of the second. Did I mention it was free? That’s it. You’ve got a week to pack. Get to it!